All people benefit from a sense of belonging, to their families, culture and communities. It is especially important in the case of parents caring for young children. Parents need to feel supported by family, friends, the community and by service providers. Indigenous people, through a long history of assimilation and discrimination, may not have this sense of belonging. This may impact their health and sense of worth, and may result in feelings of despair and hopelessness. There are many things that service providers can do to foster a sense of belonging in Indigenous families with young children, connecting parents to the information and supports that they need in a respectful and caring manner, and acknowledging their strengths. 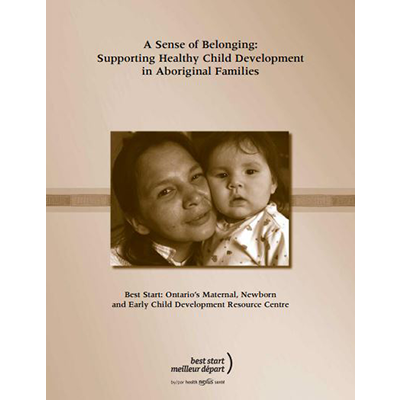 This manual was developed to improve service delivery to Indigenous families in Ontario. It shares important information about what Indigenousl people feel they need to support their families in raising happy, healthy children. While this manual will be most helpful to non-Indigenous service providers, it may also be useful in the orientation of new Indigenous service providers.